Be reminded of all the wonderful blessings in your life with this DIY Thanksgiving Gratitude Tree craft that also showcases some of your favorite photos. Keep reading to learn how to make a gratitude tree for yourself. I have been wanting to make a blessing tree for quite some time now after seeing a bunch of ideas a couple of years ago on Pinterest. The design varies, but basically you have some sort of branches acting as the tree, then you write what you are thankful for on the leaves. It makes a beautiful Thanksgiving decoration and is a great reminding of all that you have to be thankful for in your life. At first I thought about just using a fallen branch from my yard to make a gratitude tree, but when I saw a 26 inch Indoor Lighted Branch in the floral section at a local craft store (similar to this one on Amazon), I knew it would be perfect to use for this project. The one I bought has 20 tiny LED lights. 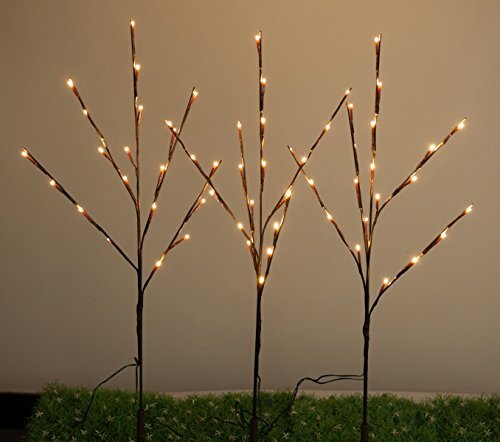 The branches on this lighted tree can be bent anyway you like so you can really spread them out to look more like a tree. It is battery operated so you can put your DIY Thanksgiving gratitude tree anywhere. I am setting ours on the table as a centerpiece. I just love how my blessing tree turned out. I used a combination of watercolored leaves and glitter leaves strung with alphabet beads spelling out things things for which I am thankful. It looks so pretty lit up at night with the light reflecting off the glitter! You might already have quite a bit of this on hand, but this list is absolutely everything you will need for this Thanksgiving tree craft. I hunted for quite awhile looking for at base for my Thanksgiving tree. At first, I thought I was going to use a vase or some sort of decorative container. Then I started exploring the idea of using some sort of wood plaque as a base. However, when I found this unfinished wood photo cube in the wood crafts section at Hobby Lobby, I knew it would make the perfect base. Start by finding the center of the lid for your photo cube. Using a ruler and pencil, draw diagonal lines from corner to corner, forming an X. Where they intersect is where you want to drill a hole. I used a 5/16″ drill bit to make the hole in mine, but the size drill bit you will need will vary based on the diameter of the branch that you are using as the trunk of your tree. You want a hole that is just a tad larger than the diameter of your tree trunk. You want the hole large enough that you can easily insert the branch and remove it, but not large enough that it will move around or flop over. Next you will want to paint your unfinished wood photo cube that will serve as the base for your DIY Thanksgiving gratitude tree. I like the distressed look so I went with Folk Art’s Painted Finishes Barnwood Kit. However you can stain or paint it however you like. Before you start painting, be sure to remove the glass and photo inserts and set aside in a safe place. 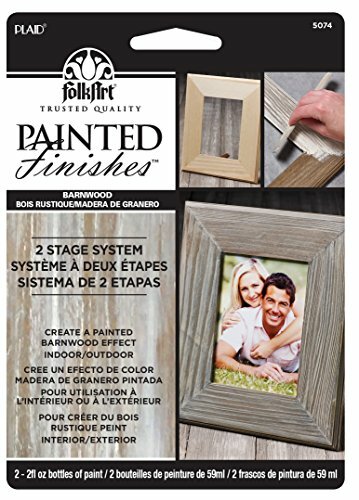 If you go with the Barnwood Painted Finishes Kit, it is a 2 step process. Start by using the bottle marked Barnwood Tint. Apply the tint all over the outside of your photo cube. Make sure you get into all the little tiny crevices on the base of the photo cube. You only need to do one coat, but make sure everything is well covered. 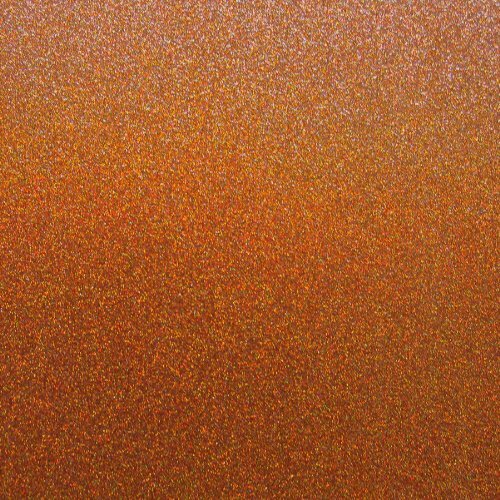 You don’t have to mess with painting the inside of the photo cube as you won’t see it when you insert your photos. Allow the tint to dry for 4 hours. The next step is a bit more involved. I recommend working in sections. So I completed all the steps for the lid, then moved on and did each side separately. Start by applying a liberal coat of the Barnwood Wax. Then use a lint free cloth to wipe off the excess. Then you are going to use a credit card or craft stick to scrape along the painted surface. Scrape in the direction of the grain of the wood. This will remove even more of the wax and leave you with the beautiful distressed finish. Repeat the process for each of the sides of the photo cube. Allow the paint to dry for 24 hours before you proceed any further with these blessing tree instructions. While you are waiting for the paint to dry, go ahead and choose your photos. You will need 4 photos for the base. I have a Canon Selphy Photo Printer, which makes quick work of printing the photos for this project. No running to the store to pick up prints! Then all I had to do was cut the photos down so they would fit in the sides of the cube. After the paint has dried completely, insert the glass and your photos into the base. Now we are going to work on the lid a bit to make it more stable for the tree trunk. To do this, you just need to glue a 3 inch wooden spool to the bottom of the lid, being sure to line up the holes. It turned out that the hole in the spool I bought was nearly the same size as the hole I drilled in the lid. But be sure to check yours to make sure you don’t need to drill it to make the hole in the spool larger. I also glued a wooden nickel to one of the ends of the spool so that my blessing tree trunk would not go all the way to the bottom of the cube. That way it would stand taller and give me more room to add leaves. That step that is completely optional though. Use Liquid Nails to glue all the wood pieces together. While the glue was drying, I kept a pencil inserted into the spool and the lid to keep the pieces from shifting. You need to make sure the hole for the gratitude tree remains unobstructed by glue. After the glue has dried, insert the lighted tree branch into the hole on the lid. Here you can see that the wooden spool keeps the tree trunk from slipping too far down in the photo cube yet provides stability so the branch doesn’t flop over. Now that we are done with the base, we are ready to proceed with the leaves for our gratitude tree for Thanksgiving. The next step to make a blessing tree is to create the leaves. For each leaf cluster, I used one glitter paper leaf and one watercolor leaf. Let’s start with the watercolor leaves first. Cut your watercolor paper into 3.5″ squares using a paper trimmer. You will want 8-10 squares. Before you add the watercolor to the leaves, you will want to protect your workspace. I put down a cut up cardboard shipping box and a layer of newspapers. You will need a container of water for your paintbrush. (I just used a plastic takeout container.) Use a paint brush to coat both sides of your watercolor square with water. Wetting both sides will help keep your paper from curling on you as you work. Place 4-6 drops of each ink color in a palette or on a clean plastic lid (like you find on sour cream or yogurt containers). Dip your paint brush in one of the colors of ink, then dab it onto your wet watercolor paper in several different spots. After you lift your brush, the ink will spread out. Repeat with the remaining colors, until the square is filled with the bursts of color. Do this process for all your watercolor squares. Allow your watercolor squares to dry for an hour or two. I know they kind of look like a mess now, but when you cut them into leaf shapes, they will be really cool looking! 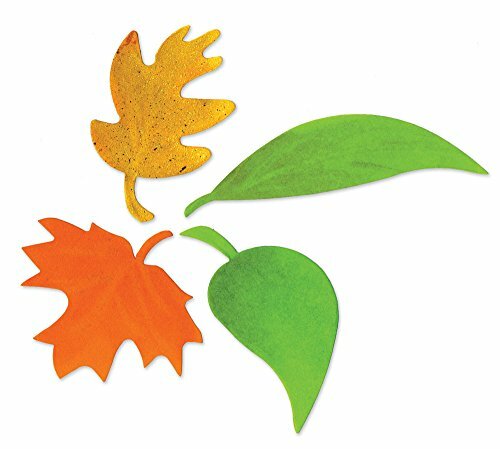 Use your die cut machine and a maple leaf die (or the leaf shape of your choice – it doesn’t have to be Maple!) to cut your watercolor squares into leaf shapes. If you do not have a die cut machine, a maple leaf punch will also work. Use the largest size you can find. See how pretty they look when they are cut out?! Next use the same die to cut out 8-10 leaves from orange glitter paper. Quick tip: Put a piece of tissue paper between the die and glitter paper before you roll the die through the machine. I didn’t do this and my die is now covered with glitter! Use foam adhesive to stick a watercolor leaf and glitter leaf together at an angle, referring to the photo above for placement. Punch 3 holes (see above) using a 1/16 inch hole punch. Repeat this process for all your blessing leaves. I used the We R Memory Keepers 1/16″ Crop-a-dile-punch to make the holes. I love it because it punches through nearly anything and can do multiple sheets of cardstock at once. 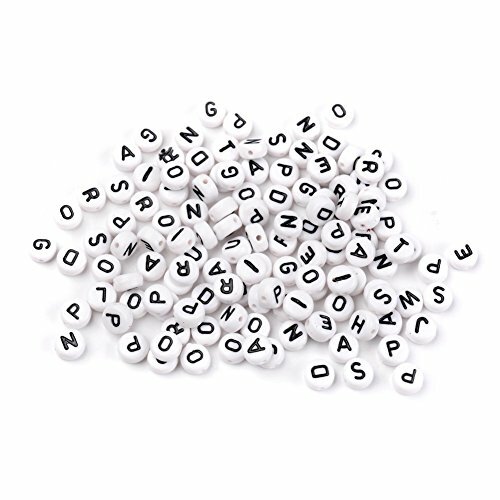 Next you will want to pull out alphabet beads to spell out 8-10 things you are thankful for. Use a thin fishing line to string your beads. It’s clear and won’t show up against the leaves. Plus you don’t have to mess with threading a needle! Insert one end of the fishing line through the hole on the front side of the glitter leaf. Tape down the fishing line on the back of your leaves. Leaving a 3-4 inch tail, cut the fishing line and insert the end into the hole on the front of the watercolor leaf. After you have the beads hanging like you want, tape the end of the fishing line to the back of the leaves. If the beads won’t lay nicely against your leaves, you can use a mini glue dot on the back of one or two of them to stick them down. Cut an 8 inch length of twine and insert into the top hole and tie to form a hanger. Repeat the process for each of your remaining leaves. After you have gotten all your gratitude leaves done, hang them on your blessing tree as desired. Here is a close up of 2 of the sets of leaves. I just love that glitter and watercolor combination. So pretty! If you are going to make a Thanksgiving tree, I recommend you get the whole family involved in the assembly. Let everyone pick a couple of things that they are thankful for to add to the Thanksgiving tree. They could even sign and date the back of the leaves if you want. And here is the blessing tree all lit up. Isn’t it pretty? It would make a great centerpiece for your Thanksgiving table! Another quick tip: If you decide to make a blessing tree of your own, you can store the gratitude leaves in the photo cube base when you pack up your Thanksgiving decorations. This will keep them from getting lost or bent. I had so much fun making this DIY Thanksgiving gratitude tree and just loved how it turned out. I think we are going to make additional leaves in the future and really fill out our blessing tree. It will be a great visual reminder of how much we have to be grateful for. If you have any questions or comments about these blessing tree instructions, be sure to leave me a comment below. So tell me… Have you made any Thanksgiving crafts this year? I love this project! So pretty and perfect for thanksgiving.